I saw my first long-tailed duck (Clangula hyemalis) in late December 2017 off the beach at Great Kills, Staten Island. A friend calls them the "beagle ducks," because these ducks do have a Snoopy quality to their faces! 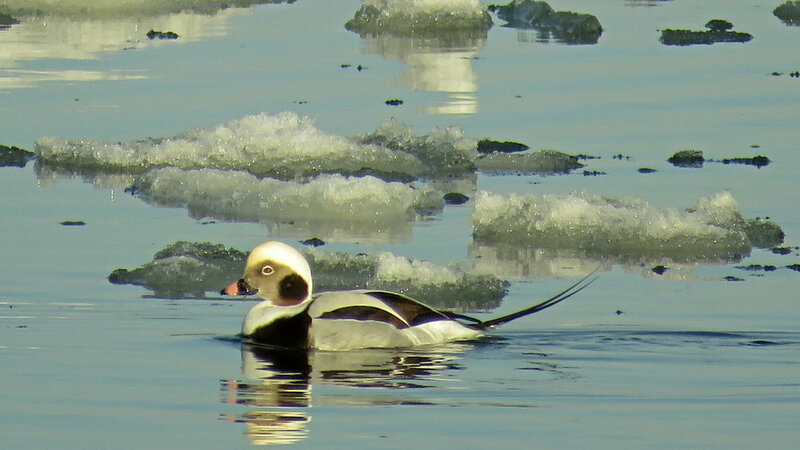 These ducks breed in the Arctic, and can be found during the winter on both coasts of North America. The Filming the Feathers video was filmed December 28, 2017, at Great Kills, Staten Island, and January 10, 2018, at Floyd Bennett Field, Brooklyn. It is set to music by Anton Diabelli, performed by Papasyuzo and obtained from MusOpen.org, a royalty-free music source. These photos were taken at Floyd Bennett Field on Jan. 10, 2018.